An ongoing regulatory kerfuffle about whether distilleries can serve cocktails ran into a new wrinkle this week. In January, the state agency that oversees alcohol regulation decided that distilleries could no longer serve mixed drinks — instead, they would need to serve one glass containing alcohol and a second containing mixers. But the ruling was tossed because the public notice was incorrectly posted, the Alcohol and Marijuana Control Office announced during the Alcoholic Beverage Control Board meeting Tuesday. "Due to a misunderstanding, (the office) did not publish the notice of the distillery regulation in a newspaper of general circulation or a trade publication," Alcohol and Marijuana Control Office director Erika McConnell wrote in an email. Instead, the public notice was posted in the Anchorage Press, which is not considered a statewide publication, McConnell wrote. Now, it's back to the drawing board. The state will need to post the proposed regulations again, take more public comment, and address the issue again at the board's June meeting. The mixed drink issue began in the fall. 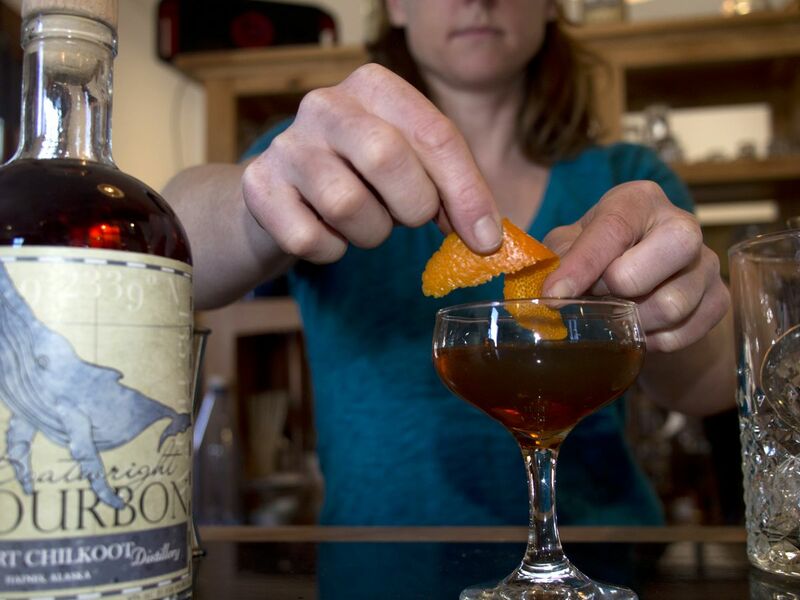 The conflict centers around vague language in Alaska's laws that says the businesses may serve "the distillery's product" to customers in their tasting rooms. But arguments on both sides have extended beyond the way the law is worded to questions of public safety, whether tasting rooms are "de facto bars," and how tasting rooms affect Alaska's alcohol licensing system. Distilleries say they've been serving cocktails since 2014, when legislators passed a bill allowing for distillery tasting rooms. Alaska regulators said that they didn't know distilleries were selling cocktails during that time. After complaints landed at the state regulatory office this summer, distilleries were told that the law only allows them to serve their own products, not cocktails made with store-bought mixers. Then, in January, the Alcoholic Beverage Control board ruled that distilleries could not longer serve any mixed drinks — but they could serve a shot and a non-alcoholic drink side by side, for the customer to mix themselves. Rob Borland, owner of Ursa Major distillery in Fairbanks, said that customers balk when they order a rum and Coke are served a shot of rum and a glass of Coke separately. "They think that it's absolutely ridiculous. They think we're kidding at first," Borland said. With January's decision scrapped for now, distilleries are reverting to the guidance they got in September: Only mix cocktails with what you make on site. Everything else goes in separate glasses, one for alcohol, the other for mixers. Preventing 'big brewers' or causing an 'arbitrary inconvenience'? Two corresponding bills in the Legislature – House Bill 269 and Senate Bill 153 – would clarify the law's language and let distilleries serve mixed drinks. The bills have been sitting in the both the Senate and House's Labor and Commerce committees since January and February, respectively. When asked why the bill hasn't been heard, Senate Labor and Commerce Chair Mia Costello, who represents West Anchorage, said lawmakers have been too busy. "We've been extremely busy passing bills. We have another day of committee hearings … I can't really respond to whether I'm (going to have) a hearing on it," Costello said. Fairbanks Rep. Adam Wool, vice chair of the House Labor and Commerce Committee, owns a bar directly across the highway from Ursa Major. Borland has been petitioning the public to contact Wool. "I appreciate the feedback everyone has provided, and I want to make clear that I am not anti-cocktail or anti-distillery," Wool wrote in a weekly newsletter. "In fact, I am working on ensuring that distilleries will be able to mix cocktails as part of a larger rewrite of Alaska's alcohol licensing laws." In a Fairbanks Daily News-Miner editorial, Wool argued that tasting rooms disrupted Alaska's three-tiered alcohol system, where production of alcohol is separate from distribution or retail sales. "This system dates to Prohibition and is set up to prevent big brewers or distillers from controlling all facets of the alcohol business," Wool wrote. The Alaska Cabaret, Hotel, Restaurant and Retailers Association — known as CHARR — spoke out against the practice during September's meeting, calling tasting rooms "de facto bars." Distilleries argue that other rules — like the 3-ounce alcohol limit per customer, ban on entertainment and abbreviated hours — already mean they are not operating as bars. Serving alcohol in shots, instead of mixed drinks, would be detrimental to public safety, distilleries argue. "It's crazy that these kinds of regulations are purely protectionist regulations. They don't have (the customer) in mind. They aren't about public safety," said Amalga Distillery co-owner Brandon Howard. "What they're saying is you have to go through this ridiculous, arbitrary inconvenience so we can further protect the bar owner," Howard said. The board will review the rules in June. "If the board adopts the regulations change, it will go to the Department of Law for review, and then to the Lt. Governor for signature. The regulation would become effective 30 days after the Lt. Governor signs it," McConnell wrote.